It’s important to plan ahead, especially if you’re getting ready to quit earning income. In the years leading up to retirement, check your retirement benefits regularly to ensure that you’ll have enough income to successfully make it through retirement. Double (and triple) check the numbers, because it’s hard to go back to work after you’ve tasted freedom and given up your position. Your retirement benefits can come from several sources, and it’s probably a good thing if you’ll get income from multiple places. Just like you diversify your investments, it can be helpful to have different pools of money to depend on. If one of them goes sour, the others will hopefully continue to support you. The most common providers are described below. Check with these organizations to find out what to expect and learn the rules on taking benefits. For most retirement-age Americans, Social Security is a significant part of retirement income. During your working years, you contribute to the system, and once you reach retirement age, you start taking withdrawals. Payments continue for the rest of your life, and spousal benefits may be available. How it’s determined: The benefit you get from Social Security depends on how much you contributed — how much you earned, and for how many years. Higher earnings mean that you contributed more and you can expect a higher benefit. But there are maximums and complicated calculations that determine your actual benefit amount. To check your Social Security benefit, visit the SSA website and read your benefit statements. But don’t just count on those printed statements — they actually tell you that things could change. Especially if you still have 10 or more years until reaching retirement age, Social Security could very well get less generous. While you’re on the SSA website, take advantage of the various calculators to run some what-if scenarios. Check to see what would happen to your benefit if you work a few extra years or if you quit today. This type of exercise helps you understand the Social Security system and how your benefits are determined. In addition to Social Security, you might contribute to retirement accounts (possibly with the help of profit-sharing or matching contributions from your employer). How your income is determined: With these types of accounts, your retirement benefit is based on how much money you have and how long you can make it last. There is no guaranteed benefit like a lifetime payment from Social Security: once the money runs out, it’s gone. However, it is possible to buy an annuity to get lifetime income (but the income is guaranteed by a private insurance company — not the US Treasury). As a result, it’s difficult to predict what your income will be, and it’s probably best to be flexible and willing to make changes if things aren’t going well in your account. How to check your retirement accounts and estimate: Checking your retirement accounts is easy. The difficult part is predicting how much you’ll get out of those accounts. If you like rules of thumb (which can never be perfect, but they give you a ballpark idea), you can start with the 4% rule described below. However, the best way to do this is to make assumptions (including positive and negative what-if scenarios) and calculate how things will happen every year going forward. Most financial planning software — and even free online calculators — make this easy. See how to do these calculations. The 4% Rule: Another approach is to use a withdrawal rate. While the “optimal” rate is still up for debate, 4% is often used as a starting point, and there’s some good research to suggest this is reasonable. Researchers tried to determine how much you can withdraw from your savings without running out of money over a 25-year (or so) retirement. 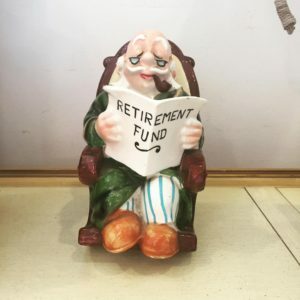 They use various assumptions of investment returns, and 4% fared well — you would hopefully not run out of money before you die. Four percent sounds low, but the stakes are high, and it’s an inflation-adjusted income. To use this rule of thumb, multiply your account value by 4% to arrive at your first year’s income. For every year after that, you can expect your income to rise slightly along with inflation (so you hopefully won’t lose purchasing power). Example: You have $100,000 saved for retirement. Multiply $100,000 by 4% (which can be written as $100,000 x .04). The result is $4,000, which would be your first year’s annual — not monthly — income. Assuming inflation is 3.5%, your income in the following year ($4,000 x 1.035) would be $4,140. And so on. Again, the 4% rule is just a basic rule of thumb. To use it successfully, you’ll need to get sufficient investment returns. Keeping all of your money in cash probably won’t work out well, and significant losses — especially in the early years of retirement — can also cause problems. You’ll also need to be flexible: in some years, you may have to take less than 4% to avoid tanking the whole strategy. Pensions from your employer might be another potential source of retirement income. These plans are less common than they were in the past, but they’re still out there. Like Social Security or a privately purchased annuity, a pension pays you a guaranteed income for the rest of your life. A spouse’s lifetime might also be an option. Corporate (and even local government) pension plans are often considered safe, but they aren’t as safe as a US government-guaranteed plan. How it’s determined: These plans are called defined benefit plans because your retirement benefit is actually defined (or known) before you retire. Your retirement benefit for most pension plans is determined by your earnings during your working years. In particular, your pay during your last three to five years of service might be the most important ones — but check with your plan administrator for complete details of your plan. You might be able to scale back a few years early and count previous high-earning years, or other factors may be involved. Your retirement benefit will be based on “credits” that are calculated off of your income. All that said, there are complexities to pensions that have nothing to do with your earnings. For example, if interest rates change before you lock in your monthly payment, your benefit might increase or decrease dramatically. Pension benefits are based in-part on present value calculations and factors out of your control. How to check your benefit: Pensions are complicated. The best thing to do is contact your employer or your pension plan’s administrator and ask for a calculation. Note that your calculation might only show benefits that you’ve already earned. If you keep working (more years and higher pay), you may be able to increase your retirement benefit. However, interest rate changes can also have an impact, and sometimes it’s better to quit or stick around depending on assumptions used in your plan.